CCTV Network Video Recorder or NVR is an internet protocol based device that sits on a network. Because they are IP based, Network Video Recorders can be managed remotely via a LAN or over the Internet giving greater flexibility. The basic function of an NVR is the simultaneous recording and remote access of live video streams from an IP Camera. An NVR (Network Video Recorder) is an IP-based recorder that operates independently from a PC or other operation systems. Aimed to store digital video streams from network cameras, an NVR is usually incorporated with a large-volume hard disk to allow for a long period of recording. An NVR differs from a traditional DVR in its network connectivity, which allows digital data to be transmitted to other networked devices over the internet. 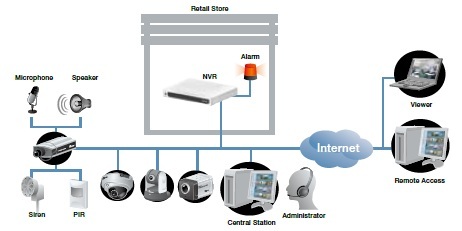 Another difference is that an NVR can be directly connected to network camera while a DVR is usually be connected to an analog camera. The NVR is capable of receiving and recording high quality H.264 video stream up to 1.3 Megapixel at the same time. The ability for the NVR to continuously record large files becomes essential. The NVR has a built-in E-SATA interface for extended storage up to 8TB. Combining the internal hard disks, the NVR provides a total of 12TB of storage space for your day-to-day recording data. In addition to the extended storage capacity, data safety becomes just as important. The NVR has built-in RAID 1 function that provides file redundancy for your recorded data. The NVR is capable of receiving and recording high quality H.264 video stream up to 1.3 Megapixel at the same time. The device is managed through an easy-to-use web interface, and all functions are available with just a few clicks of the mouse. Not only you can view the videos in a different layout, you can also set to view them in full screen or configure the web UI to automatically sequence through each channel automatically. You are also able to take snapshot of a viewing video, send and receive audio from the video or start recording right away all with just a single click. Say you have multiple cameras set up at the entrance of the building from different directions. With synchronous playback, you are able to view playback videos recorded at the same time from up to 4 cameras. The web interface provides you the functions to search recorded videos by time or by event and you can stop, pause, fast forward or rewind the playback videos at anytime. You can perform digital zoom to a playback video if it was recorded in high resolution and you can also take a snapshot or export a portion of the recorded video as AVI file onto your local PC for further investigation. You can use the on-screen virtual PTZ panel to control movement of a PTZ camera. The PTZ movement speed is adjustable if the camera supports this function. You can configure multiple PTZ preset points in the NVR or synchronize them from the camera and use the virtual PTZ panel to jump through the preset points. You can also use the PTZ panel to start automatic sequence viewing among the preset points. Users get full experience of the Google map functions and visual notification of events that are coming from any camera. The Google map is embedded to the NVR web UI, providing instant event notification along with camera’s geographic information. You can zoom in to a smaller region to monitor events from particular cameras within that region and if an event is triggered from a camera that is located outside of your current viewing area, the map moves automatically to the area of where the event trigger camera is located. You should still be in control while you are on the go. The NVR can be connected with major smart phones and live images can be viewed with their built-in web browsers. No additional software or plug-in required. You are able to view live images and perform PT control through the browser. You can also adjust the video refresh rate instantly if you are in an area where bandwidth is limited. The software is designed with a true client-server architecture. Once it’s installed, it runs as one of the Windows services and operates in the background. You can install the client-side software on another PC and perform tasks such as live video monitor, playback, or change configurations. It has a built-in web server which allows you to access the vOptimus Pro server for live video monitor and playback without installing any additional software. The software provides instant event notification and playback that are coming from live videos. It also keeps a list of log of previously triggered events that lets you playback at anytime. It not only provides a live video from the channel with event trigger but also its channel detail information as well as its geographic information with an embedded mini e-map. It’s a function that’s specifically designed for event triggers which only gives you meaningful information and notification. The software provides multi-layered E-Map giving users a clear overview of where cameras are located. It supports PIP (Picture-in-Picture) map views and all layers provide on-the-fly instant notifications with videos displayed whenever the system detects an event. The software is designed with friendly user interface that provides intuitive controls such as drag ‘n drop. Users can re-arrange position of each video at anytime by simply clicking and dragging a video window and dropping it onto a different one. The NVRs and cameras are listed on the side and users can simply drag’n drop a camera from the list and drop it onto a desired video window, or simply drag a NVR and drop it in the video area and all channels will be placed and displayed with positions of each channel arranged automatically. The built-in smart motion detection function allows users to configure one or more regions in a video as motion detection areas for event triggers. This function detects motion area to pixel accuracy based on “Adaptive Temporal Differencing” technology, which is a surveillance-specific morphology operation that is integrated to filter out noise and enhance motion area simultaneously. SMD has been tested in general indoor/outdoor environment. It is also applicable to low light conditions or infrared images. This function allows users to set a detection area in the scene for triggers in the event that an item is removed from its last location. It provides effective protection of highvalue items such as works of art, jewelry and expensive electronics or machinery. It may also be used to ensure that Health and Safety signage or other safety-critical displays are not obscured. Users can create one or more virtual lines and sets detections to be triggered when a person or a vehicle is crossing one of these lines. It can be used to prohibit or allow movement in a scene. It triggers an alert when camera operation is disrupted by situations such as blocking the unit, low visibility or redirection. It enables security staff to swiftly pinpoint and address cameras that are no longer providing effective coverage. Cameras may be vandalized or may be attacked in a multitude of ways, to remove security coverage as a prelude to an attack. The view of the camera may be obscured using a plastic bag, the camera lens spray painted or the camera moved from its correct position. All of these attacks can be detected immediately by the IVS function and an alarm generated. This function is aimed to improve the interpretability or perception of information in images for human viewers.